Stream Smart – What Is Low Impact Development? Low Impact Development (LID) is an approach to stormwater management that is modeled after nature: manage rainfall at the source and mimic a site’s predevelopment hydrology by using designs that infiltrate, filter, store, evaporate, and detain runoff close to its source. LID seeks to address stormwater through small, cost-effective landscape features located at the lot level instead of conveying stormwater to large pipe systems. By managing more stormwater on site, we also keep pollutants out of our streams and allow the landscape and its natural processes to deal with the pollutants by absorbing stormwater and breaking down contaminants. In the Rogue Valley, several jurisdictions have been issued Phase II Stormwater permits (Municipal Separate Storm Sewer System permits (MS4)) from the Oregon Department of Environmental Quality. The permits require the jurisdictions to manage stormwater quality during construction, as well as post-construction for projects within their boundaries. 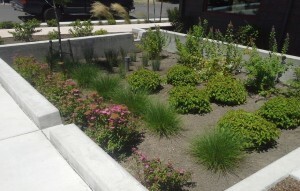 To accomplish this, the Rogue Valley permitees have jointly adopted the Rogue Valley Stormwater Design Manual, which provides guidance for creating stormwater management features that comply with local codes and ordinances. All development and redevelopment projects of 2,500 square feet or more, within a permitted jurisdiction, are required to follow the Rogue Valley Stormwater Design Manual. Contact the city or county of your project to find out whether they have adopted the manual. Engineers and architects can contact Rogue Valley Sewer Services to find out about the Rogue Valley Stormwater Design Manual and local classes on LID, and the Design Manual is available for download from RVSS’ website. Construction projects larger than one acre must have an erosion and sediment control permit, contact your jurisdiction to find out how to obtain a permit. Permits require that a certified erosion and sediment control inspector is assigned to the project. Certification classes are provided by Rogue Valley Sewer Services, visit their website to find out about class availability. A list of currently certified erosion and sediment control inspectors is also available. Construction projects less than one acre in size often must have small site erosion and sediment control permits from the local jurisdiction, these permits do not require a certified erosion and sediment control inspector, but do require proper installation and maintenance of erosion and sediment controls. Contact your local jurisdiction to find out if a small site permit is required.